if you're a regular CNN visitor to their website, you're probably bombarded by the iReports which readers contribute pictures and stories on events they're a part of. More recently, there are a lot of articles, pictures, and videos documenting the devastation caused by Hurricane Ike. And the recent train accident in North Los Angeles has passengers contributing stories from the site of the event. These are changes that not even Big Brother in 1984 could have anticipated. Although I'm optimistic about bloggers and, now, ireporters picking up their smartphones or iPhones and hack out a story and send them to news outlets, we need to be ware of the authenticity and accuracy of the story. About a year ago when fire was raging through Southern California, I had used Cirqo linked to other feeds to provide my friends with updates on the fire situation. Twitter has seen a role big role in this year's Presidential race as pundits, political operatives, and campaigns use it to reach out to their supporters. 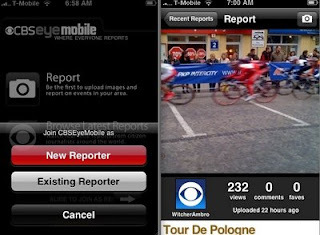 Take capitalize on mobile warriors who want to contribute to events, CBS introduced an app for the iPhone to easily let iPhone owners report on events. A quick glance showed a lot of articles about weather in the South and about the Presidential Campaign. This is more than just a trend as Web 2.0 and our mobile technology get even better for citizen reporters who want to provide an outlet for local or national interests. I love to hear from mobile warriors who have used their phones or laptops to contribute to a media story.